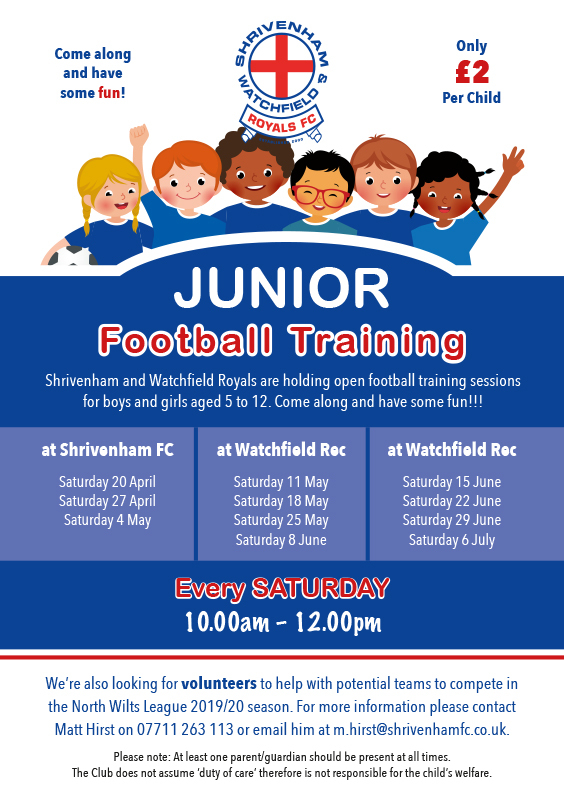 Shrivenham and Watchfield Royals are holding open football training sessions for boys and girls aged 5 to 12. Come along and have some fun! We’re also looking for volunteers to help with potential teams to compete in the North Wilts League 2019/20 season. For more information please contact Matt Hirst on 07711 263 113 or email him at m.hirst@shrivenhamfc.co.uk. Please note: At least one parent/guardian should be present at all times. The Club does not assume ‘duty of care’ therefore is not responsible for the child’s welfare.